An internal microprocessor provides the flexibility and convenience of software control and the system status is presented on an easy-to-read LCD graphics display. Control of the Model LDC1000 can be achieved from the front panel or remotely via an RS-232 interface. The LDC1000 features advanced circuitry to protect both the diode and the controller. Safety features include transient suppression, a suitable mains filter, delayed output enable, hardware interlock and a relay closure shorts the laser output when power to the LDC1000 is turned off. In any case of error, such as exceeding the customer set limits, the diode current is turned off immediately and an error message appears on the display. External inputs allow analogue modulations and external triggering. An internal pulse generator allows digital modulation. The maximum modulation frequency of the laser diode current is 100Hz. 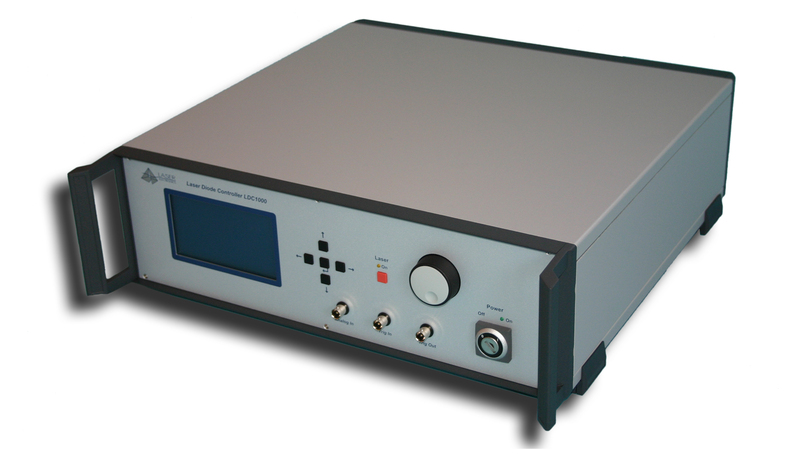 If a high power laser diode is provided with a pilot laser, it can be controlled by the LDC1000. The pilot laser can be switched on and off and its optical power intencity can be set. If a high power laser diode is provided with a power monitor diode, which deliver a voltage corresponding the optical power it will be shown at the display and can be used for calibrating the LDC1000 P/I characteristic line. Because the laser driver is current controlled, the laser power cannot be controlled directly. But the user can set two calibration points at the P/I characteristic line and the LDC1000 calculates the set power into set current and measured current into actual power. So the user can choose to set the laser current or set the laser power and can read the actual current and the actual power from display. The LDC1000 can work with three several temperature sensor types: NTC, PT100, PT1000. The LDC1000 can easily adapted to different heat sinks by the software PID controller. An adjustable TEC current limit prevents the controller from overdriving the TEC element. The LDC1000 includes a 300W or 600W thermoelectric cooler controller. Our heat sinks COOL30 and COOL50 are suitable for cooling 30W and 50W (optical power) laser diodes. They need the 300W TEC driver. Our heat sink COOL100 is suitable for cooling a 100W (optical power) laser diode and needs the 600W TEC driver. Normaly the heat sink is provided with a powerfull fan. In most cases the full fan power will not be used. For that reason the fan voltage can varied between 6 .. 12V.